No matter how well you schedule your time, if you don’t have the personal energy to fulfill your commitments things may not get done. You will still attend meetings and outings, but you may not be fully present. Instead, your brain will be a little foggy, and your body will slouch. When you combine managing your personal energy along with managing your time you will become happier, fully present in the conversation, and effective. Time Management is about planning how much time you have in a day for meetings, kid activities, meal planning and downtime to spend recouping from your day. This is a good time management, right? It flows nicely with small breaks in between. But what if the breaks aren’t long enough to absorb what happened during that time? What if what happened in one of those meetings completely depleted your energy? What if you got bad news from your child’s school? You still attend the rest of your meetings or get ready for dinner, but mentally you are dragging, have difficulty focusing, and can’t operate at your top game. What is Personal Energy Management? 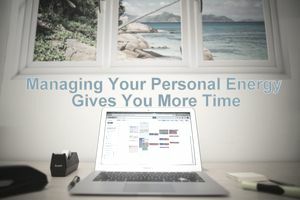 Personal Energy Management is about being aware of how much mental and physical energy you have throughout your day to do your planned activities. The problem with using just time management is that it ignores the emotional side of things. We’ve been taught to leave emotions at the door, but emotions are a funny thing that will sneak up on you when you least expect it. You need to take into account how your life and career experiences will affect your personal energy. When you take a break from work or a step back from your emotions, you rest your body and mind. Will your meeting topics affect your personal energy? Timely plan rejuvenating actions before and/or after your meeting to boost your personal energy. What Happens When You Combine Personal Energy and Time Management? When you use personal energy and time management, you find more time to do more. You spend less time dealing with emotions because you’ve built in space to respond to life. You become more effective, efficient and accomplished. You discover your Mommy Energy and how focusing on the energy your family gives you can fuel you throughout the day. You discover that time doesn’t matter as much because your personal energy begins to dictate how you’ll spend your time.